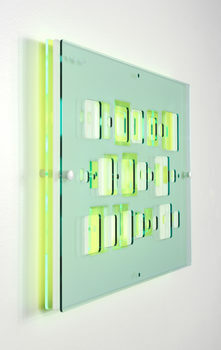 Wide Ruled: e 14169, 2017 Laser Cut And Engraved Acrylic, Nylon Spacers, Capped Hardware. Three Panels: Clear With Copic Marker, Phantom (Matte Clear), And Fluorescent Green. 23" X 23" X 2" © Courtesy of the artist. Wide Ruled: e 14169 (side view), 2017 Laser Cut And Engraved Acrylic, Nylon Spacers, Capped Hardware. Three Panels: Clear With Copic Marker, Phantom (Matte Clear), And Fluorescent Green. 23" X 23" X 2" © Courtesy of the artist. Wide Ruled: e 3625, 2017 Laser Cut And Engraved Acrylic, Nylon Spacers, Capped Hardware. 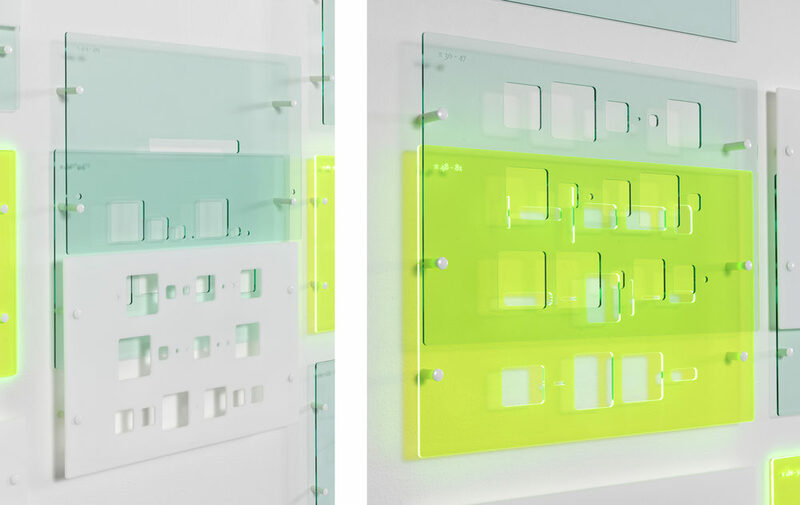 Two Panels: Fluorescent Orange And Clear. 23.5" X 20.5" X 2" © Courtesy of the artist. 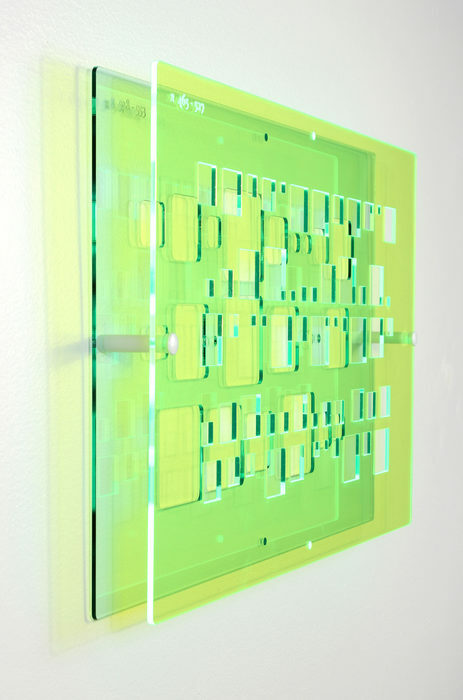 Wide Ruled: e 3625 (side view) , 2017 Laser Cut And Engraved Acrylic, Nylon Spacers, Capped Hardware. 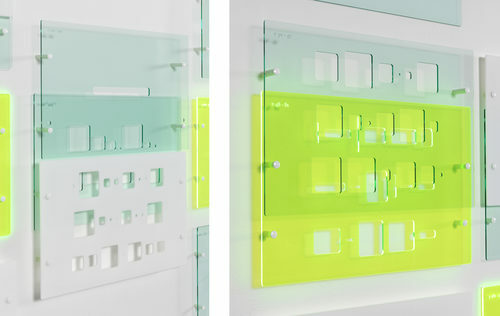 Two Panels: Fluorescent Orange And Clear. 23.5" X 20.5" X 2" © Courtesy of the artist. Wide Ruled: e 2154249 , 2017 Laser Cut And Engraved Acrylic, Nylon Spacers, Capped Hardware. Three Panels: Fluorescent Blue, Clear, Clear With Copic Marker. 23.5" X 23" X 1.5" © Courtesy of the artist. Wide Ruled: e 2154249 (side view), 2017 Laser Cut And Engraved Acrylic, Nylon Spacers, Capped Hardware. Three Panels: Fluorescent Blue, Clear, Clear With Copic Marker. 23.5" X 23" X 1.5" © Courtesy of the artist. Wide Ruled: e 9228 , 2017 Laser Cut And Engraved Acrylic, Nylon Spacers, Capped Hardware. Two Panels: Fluorescent Green And Phantom (Matte Clear) With Graphite. 23" X 24" X 2" © Courtesy of the artist. Wide Ruled: e 9228 (side view), 2017 Laser Cut And Engraved Acrylic, Nylon Spacers, Capped Hardware. 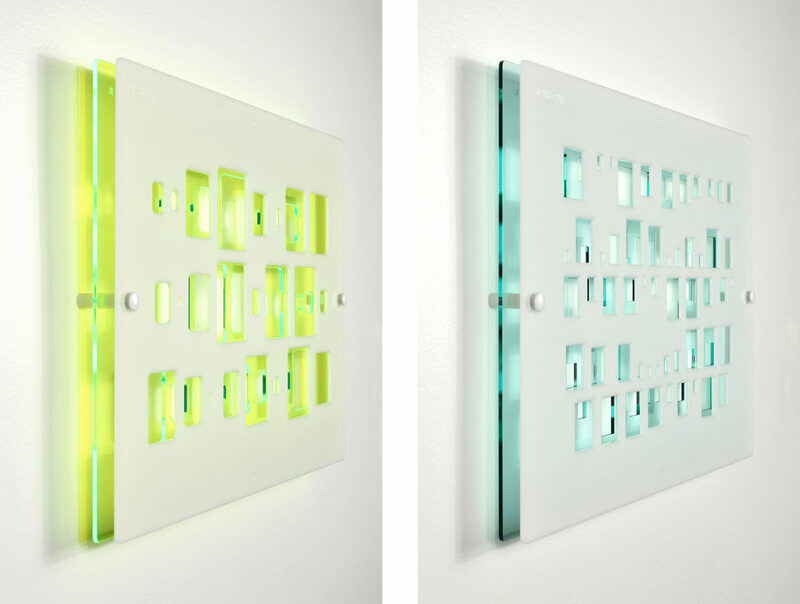 Two Panels: Fluorescent Green And Phantom (Matte Clear) With Graphite. 23" X 24" X 2" © Courtesy of the artist. Wide Ruled: e 738 , 2017 Laser Cut And Engraved Acrylic, Nylon Spacers, Capped Hardware. Two Panels: Both Clear With Pitt Pen. 23.5" X 26.25" X 1.25" © Courtesy of the artist. Wide Ruled: e 738 (side view), 2017 Laser Cut And Engraved Acrylic, Nylon Spacers, Capped Hardware. Two Panels: Both Clear With Pitt Pen. 23.5" X 26.25" X 1.25" © Courtesy of the artist. Wide Ruled: 314159, 2017 Clear, Fluorescent Blue, And 40% Light Transmission White Laser Cut Acrylic Sheet, Graphite, Nylon Spacers, And Capped Hardware. 23.75" X 17" X 2" © Courtesy of the artist. Wide Ruled: 314159 (side view), 2017 Clear, Fluorescent Blue, And 40% Light Transmission White Laser Cut Acrylic Sheet, Graphite, Nylon Spacers, And Capped Hardware. 23.75" X 17" X 2" © Courtesy of the artist. Wide Ruled: 72535, 2017 Two Sheets Of Transparent Light Bronze And One Sheet Of Matte Citrus Yellow Laser Cut Acrylic, Nylon Spacers, And Capped Harsware. 23" X 33.375" X 1.5" © Courtesy of the artist. Wide Ruled: 31415, 2017 Transparent Light Bronze, Transparent Medium Bronze, And Citrus Yellow Laser Cut Acrylic Sheet, Nylon Spacers, And Capped Hardware. 23" X 24.5" X 2" © Courtesy of the artist. 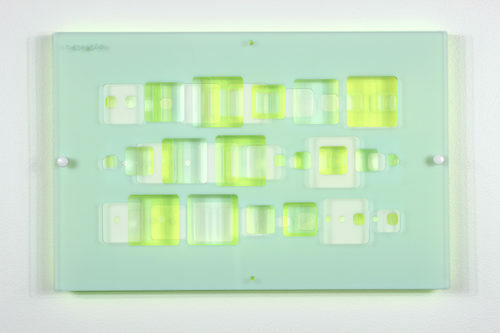 Wide Ruled: 31415 (side view detail), 2017 Transparent Light Bronze, Transparent Medium Bronze, And Citrus Yellow Laser Cut Acrylic Sheet, Nylon Spacers, And Capped Hardware. 23" X 24.5" X 2" © Courtesy of the artist. 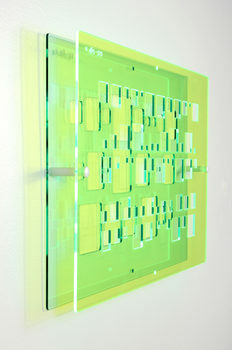 Codex: pi 1021, 2016 Laser Cut 1/8" Acrylic Sheet, Capped Hardware, Nylon Spacers. 92.5" X 134.5" X 1.5" © Courtesy of the artist. Excertpts from pi, 2016 Laser Cut 1/8" Acrylic Sheet, Capped Hardware, Nylon Spacers. 26" X 38" X 2" © Courtesy of the artist. 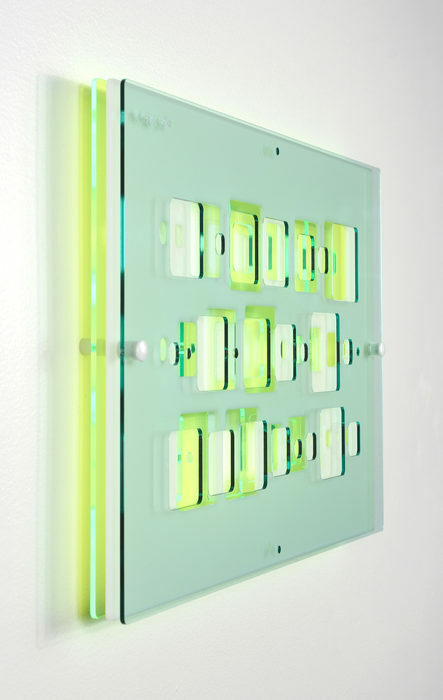 Excerpts from pi (side view details), 2016 Laser Cut 1/8" Acrylic Sheet, Capped Hardware, Nylon Spacers. Each 11.5" X 17.5" X 2" © Courtesy of the artist. 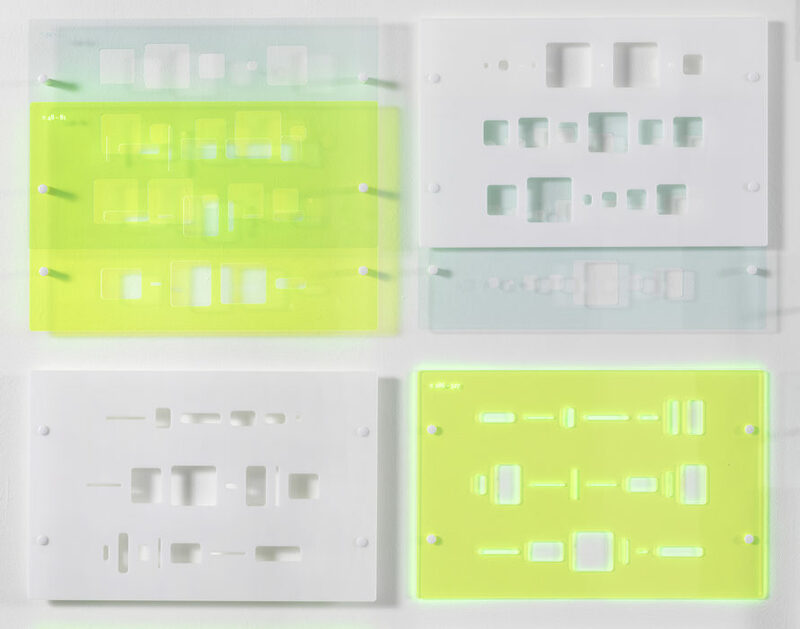 Excerpt: pi 187-210 554-580 685-711, 2016 Laser Cut 1/8" Acrylic Sheet, Capped Hardware, Nylon Spacers. 11.5" X 17.5" X 2" © Courtesy of the artist. 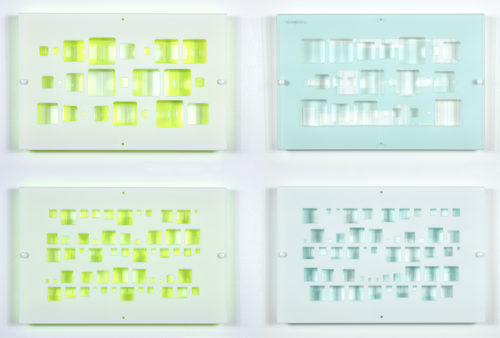 Excerpt: pi 187-210 554-580 685-711 (side view), 2016 Laser Cut 1/8" Acrylic Sheet, Capped Hardware, Nylon Spacers. 11.5" X 17.5" X 2" © Courtesy of the artist. 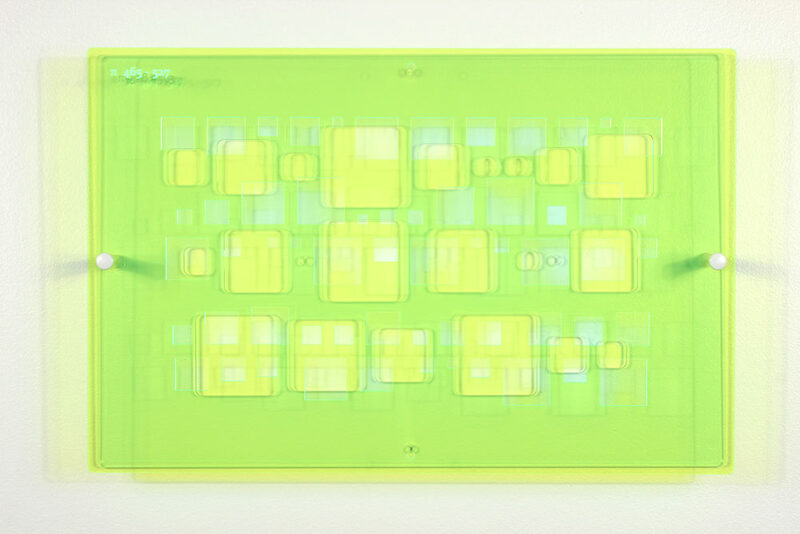 Excerpt: pi 465-553 (side view), 2016 Laser Cut 1/8" Acrylic Sheet, Capped Hardware, Nylon Spacers. 11.5" X 17.5" X 2" © Courtesy of the artist. 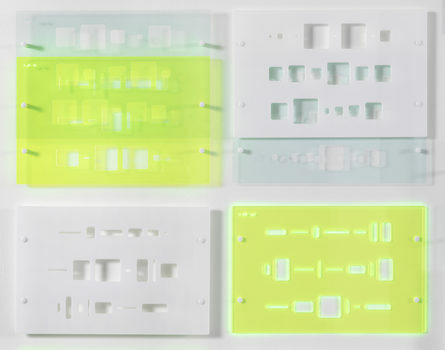 Excerpt: pi 465-553, 2016 Laser Cut 1/8" Acrylic Sheet, Capped Hardware, Nylon Spacers. 11.5" X 17.5" X 2" © Courtesy of the artist. 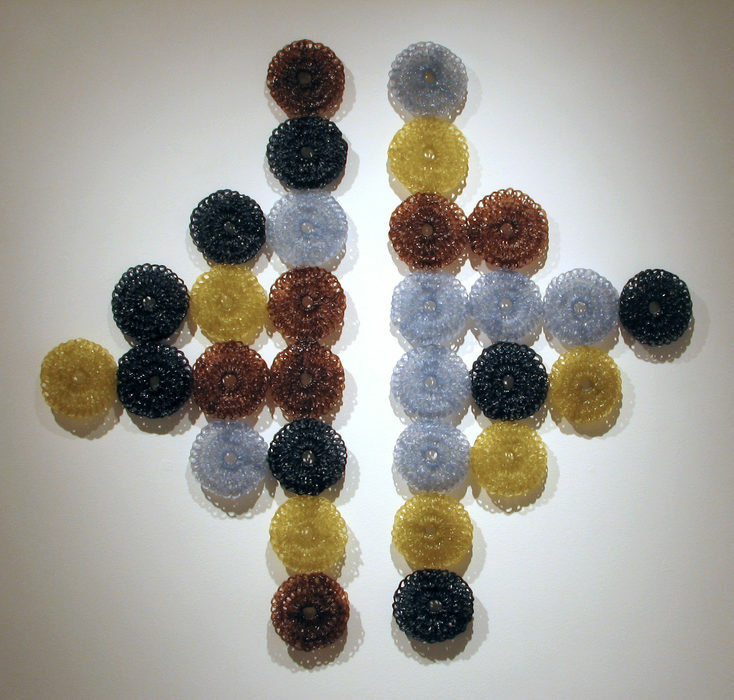 A full-time artist since 1994, I’ve exhibited extensively at regional museums, art centers, and university galleries throughout the United States. 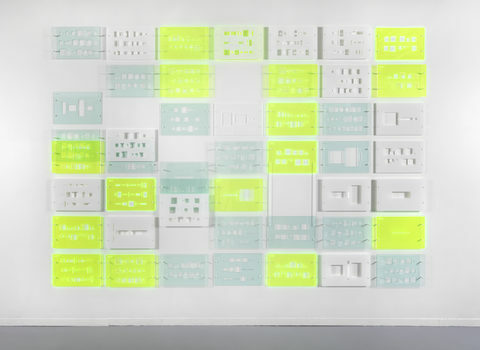 Exhibitions abroad include: U.S. Embassies in Moscow, Ankara, and Abuja; alternative galleries in London, Rome, Berlin, and Jena Germany; and the 2010 Berliner Liste art fair. 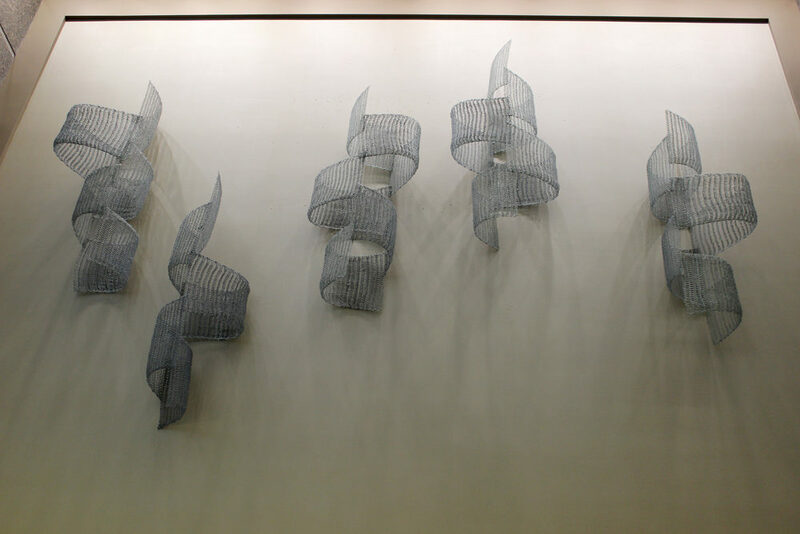 In 2005, I began working with art consulting firms, galleries, and individual clients to create site-specific, private and public commissions. Sequences from the numbers pi and e, prime numbers, grids, and repetition of simple geometric shapes are my obsession. I devise systems for visualizing numerical values by which I can create new and uncommon patterns. 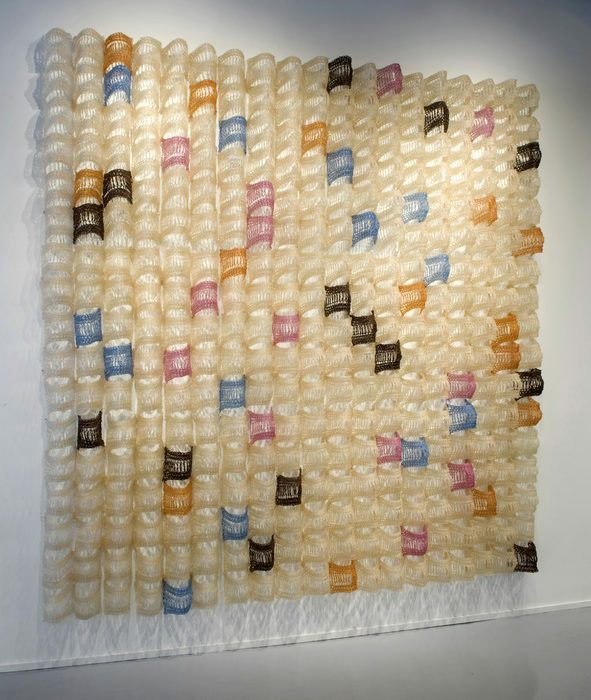 I create interior, wall-based, 3D structures in two different materials and processes. My signature material/process is crocheted fiberglass. 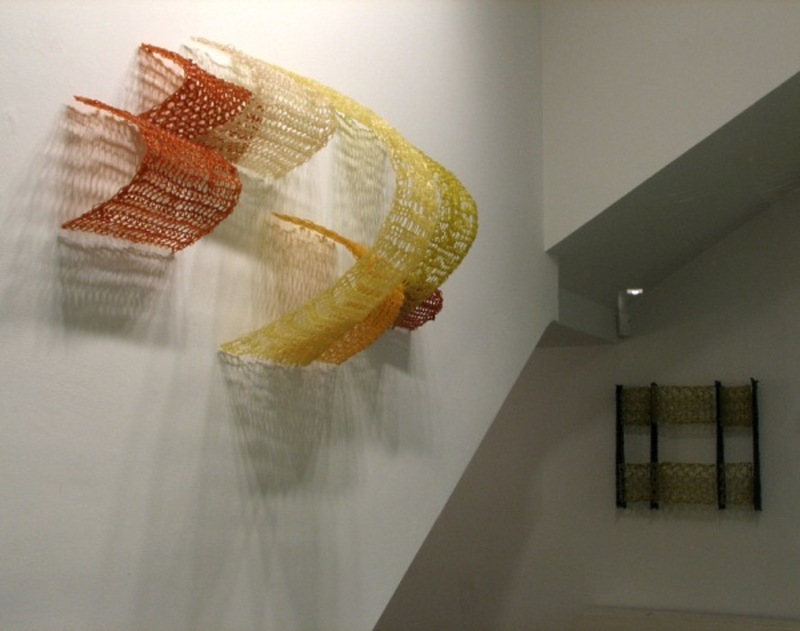 I create my own cloth by crocheting continuous strands of fiberglass into flat geometric shapes which are formed and hardened with polyester resin and use of gravity. 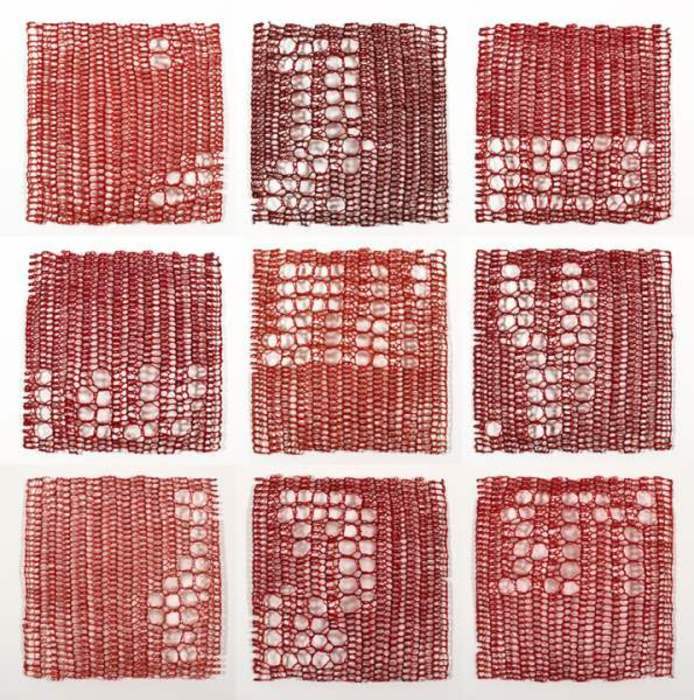 My current practice of creating math generated work and crocheting fiberglass began in 1992 when I started making sculpture that dealt with abstracting narratives of identity. 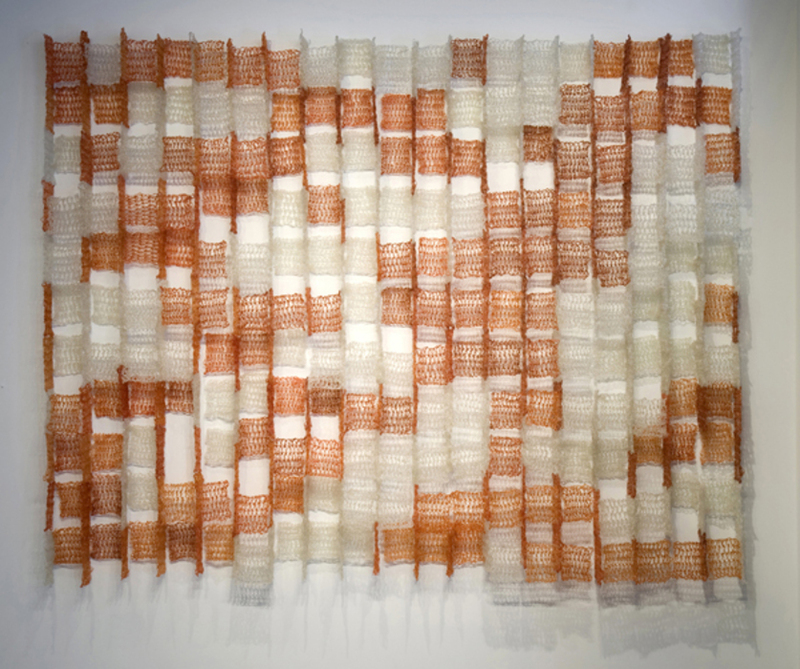 Within this context, an exploration of fiberglass and resin led me to crocheting fiberglass roving. Years later, the same pursuit led me to start mapping patterns from math sequences. 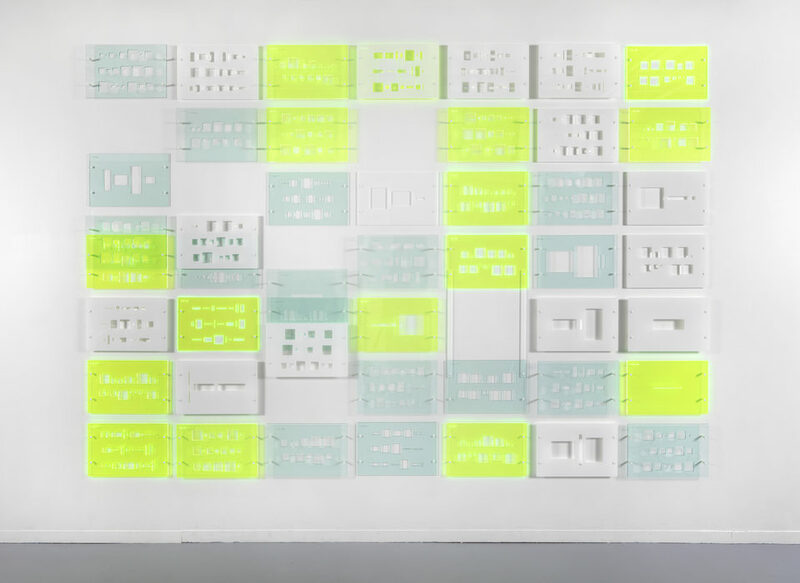 This body of work occasionally uses Pascal’s Triangle as a structure and uses the value of digits from number sequences to create surface pattern, for color distribution, and to determine 3D spatial relationships. Most recently, I began exploring new systems of mapping sequences, anchored in drawing with various media on panel and variety of papers. These 2D works range from simple notations as graph plots to complex layered patterns that visualize hundreds of digits. This exploration led to a new body of work in laser-cut acrylic-sheet with template-like cut outs, with some stacking, and use of shallow (up to 1.5”) nylon spacers. Here, simple geometric shapes plot numerical values. Further, sequences determine color placement, pattern placement, and depth. The potential here is endless!! !